(a) Physical Optics: Interference and diffraction, Dispersion of light and the electromagnetic spectrum. (b) Geometric optics: Reflection and refraction, Mirrors, Lenses. (1) When a plane mirror is rotated through an angle θ, the reflected ray rotates through an angle 2θ. (2) The minimum size (length) of a plane mirror for enabling a person of height ‘h’ to see his full image is h/2. You can easily prove this using the law of reflection (angle of incidence = angle of reflection). [The above equation is often written as 1/f = 1/u + 1/v where ‘u’ and ‘v’ stand for the distance of object and the distance of image respectively]. “The sign convention adopted widely in Optics is the Cartesian convention. 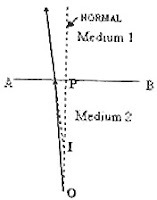 The ray incident on the curved surface is to be considered as proceeding in the positive X-direction and you have to measure all distances from the pole, which is supposed to be the origin. Occasionally, you may be given a ray diagram in which the incident ray may be proceeding from right to left. To avoid confusion, imagine that the direction of the incident ray is still in the positive X-direction. You can even redraw the diagram to make the incident ray proceed from left to right if you want. The signs given to the distances are as in the Cartesian coordinate system: pole to right positive and pole to left negative. Distances measured upwards are positive and those measured downwards are negative but you will mostly encounter problems with leftward and rightward measurements. While solving problems, you should apply the signs to all known quantities. The unknown quantities are left as they are in the formulae. You will be able to arrive at conclusions by interpreting the sign of the unknown quantity you finally arrive at as the answer. For instance, if the distance of an image is obtained as negative, you will immediately understand that the image is on the same side of the curved surface as the obj ect is”. According to the Cartesian sign convention, the radius of curvature (R) and the focal length (f) of a concave mirror are negative since you have to measure these distances leftwards (opposite to the direction of the incident ray), from the pole P (fig.). In the case of a convex mirror, R and f are positive since you have to measure these distances rightwards (in the same direction as that of the incident ray), from the pole P. Distance of a real object will be always negative since it is to be measured from pole to the object (towards the left and opposite to the direction of the incident light). You have to use the Cartesian sign convention in problems involving reflection as well as refraction at spherical surfaces. But, don’t be scared of the Cartesian sign convention. It’s simple. You will get accustomed to this sign convention when we discus problems involving spherical surfaces. When we apply the sign convention, for the upright (and virtual) image formed by a convex or concave mirror, the magnification is positive. If the image is inverted (and real), the magnification is negative. (6) n1 sin θ1 = n2 sin θ2 where n1 is the refractive index of medium 1, n2 is the refractive index of medium 2, θ1 is the angle of incidence (in medium 1) and θ2 is the angle of refraction (in medium 2). where ‘n’ is the refractive index of medium 2 with respect to medium 1. In the figure, O is the object and I is the image formed by normal refraction at the plane surface AB separating the two media.. PI is the apparent distance and PO is the real distance of the object O.
where dreal is the real depth and ‘n’ is the refractive index of the liquid. Evidently, the above equation is true in the case of parallel slabs of transparent media piled up to make a composite slab. (8) sin θc = n2/n1 where θc is the critical angle (for total internal reflection) of the medium of higher refractive index n1 with respect to the medium of lower refractive index n2. n = sin[(A+D)/2] / sin(A/2) where A is the angle of the prism. [This is often written as n2/v – n1/u = (n2 – n1) /R, using symbols ‘v’ and ‘u’ for the image distance and the object distance respectively]. 1/f = [(n2/n1) – 1] (1/R1 – 1/R2) where ‘f’ is the focal length of the lens, n2 is the refractive index of the material of the lens and R1 and R2 are the radii of curvature of its surfaces. n1 is the refractive index of the medium in which the lens is placed. The focal length of a convex lens is thus positive while that of a concave lens is negative [if the medium in which the lens is placed is rarer (n1<>2)]. [This equation is often written as 1/f = 1/v – 1/u where the distance of object so and the distance of image si in the above equation are denoted by the symbols ‘u’ and ‘v’ respectively]. 1/f = 1/si + 1/so since the sign of so is negative and the signs of si and f are positive. When we apply the sign convention, for the upright (and virtual) image formed by a converging or diverging lens, the magnification is positive. If the image is inverted (and real), the magnification is negative. Unit of focal power is dioptre. The sign of ‘f’ is to be considered when you express the power. Therefore, converging lenses have positive power while diverging lenses have negative power. 1/F = 1/f1 + 1/f2 + 1/f3 + …..etc. This is really a power equation which says that the effective power is the (algebraic) sum of individual powers. (i) A ray proceeding parallel to the principal axis will pass through the principal focus in the case convex lenses (to be more general, converging lenses) and concave mirrors. 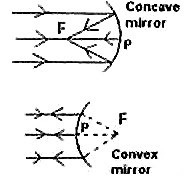 In the case of concave lenses (diverging lenses) and convex mirrors, the ray will appear to diverge from the principal focus. (ii) A ray that passes through or appears to pass through the centre of curvature of a mirror will retrace the path after reflection at the mirror. A ray passing through the optic centre of a lens (converging as well as diverging) will proceed without deviation. (iii) The law of reflection which states that the angle of incidence is equal to the angle of reflection is true for all surfaces (plane as well as spherical). In the next post we will consider questions on geometric optics. Solution of problems based on the method of ray tracing as well by the application of the formulas mentioned above will be discussed.